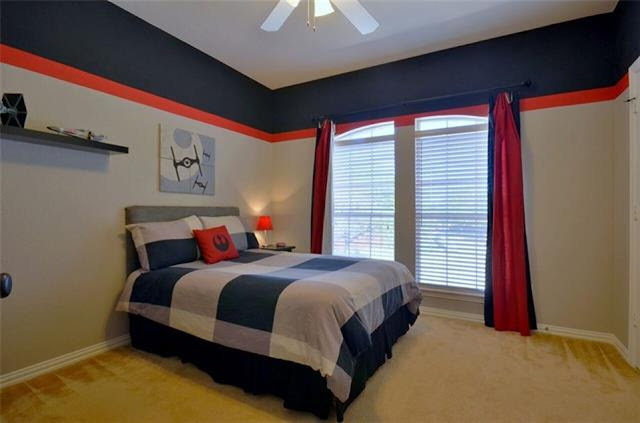 The colors in the listing photos looked navy and orange, but I think they lightened the pics quite a bit because in reality those stripes were red and black (the bedding was black check to give you an idea of the color difference.). Also, the bed that looks like a queen was actually a twin. The bed is the same one he had in the old room he shared with Mason the console table used to be in Griffin's room and the shelves I picked up at IKEA. If you don't mind shelf brackets showing, I can't say enough great things about this option for shelving. The white shelves were $10 each and the brackets were $2 (I think... maybe $3). Either way, the project was under $50 and gave Luke TONS of space to display Legos, books and other toys/projects. Luke's biggest request with his new room was a desk and places to display all of his Legos. His wish was our command. So. Let's talk Legos. I have a love/hate relationship with them. I love the hours that he spends in creative play. I hate that they're everywhere. I love that he's using his imagination and engineering skills. I love that they're amazing quality and all my kids love them. Right now he's super into Bionicles which he has proudly displayed on the table :) I have no system for organizing them. We used to - but the boys play more "creatively" than they do with sets so they jumble all the pieces together. Now they're just in big bins. UGH! Luke's other request for his room was a solar system. WHAT?!?! I teach with an amazing co-worker, Mrs. Boese, and she loves talking science with Luke. We stopped by her room after school to talk to her about making his own solar system and what was hanging in her room??? DOZENS and dozens of planets! The 8th graders had to make planets as a project and after the kids who wanted to keep theirs took them home, Luke got to go in and pick his favorite for each planet! We used command hooks and clear picture wire to hang them and he is OBSESSED! If you're looking for Luke, he's probably sitting at his cute blue desk building something or working on a dot-to-dot. ;) He loves dot-to-dots right now and they're super impressive. The bulletin board was an afterthought, but I'm so glad we added it in. He hangs his drawings and pictures and other fun things on there and I love seeing how proud he is of his work. EDITED TO ADD: I found his desk online HERE! And it's under $50 and comes in multiple colors!!! There's a clear top, black top, blue top and PINK top! He is LOVING the Magic Treehouse series! and yes, that's a giant tub of Legos at the foot of his bed. I'm eyeballing this trunk, but am waiting for it to go on sale before taking the plunge. The boys picked out bedding for their new rooms and I loved their choices. I'm not sure how long he'll want superhero sheets, so I'm embracing it while I can. PS - this post contained affiliate links which means that if you clicked on a link and purchased and item, I may receive a commission. THANK YOU!!! We gave up sorting Legos a few sets in. I think I'll miss the swooshing sound when my boy paws through the tub looking for pieces one day! I absolutely LOVE Luke's room! It's so Luke!! Love! What a fantastic room! I love that it's kid-centered and that Luke got to pick out the things he wanted in it. Love your creative storage ideas. Thanks, Eileen! I really let him have a say in pretty much everything and he LOVES it! Not necessarily how I would have done things, but it's PERFECT! So cute! It's like an amalgam of my boys' rooms- one has a TON of Legos displayed (we had to finally make a Lego table and more display area up in our playroom), and a solar system above his bed. And my other son asked for a desk for a year and we finally set him up a "work" area with a desk this summer (he's 5). I love having boys- they're so fun! His room looks great!! My kids aren't super into Legos and this post made me thankful. Ha! I love his room! I also have a love/hate relationship with legos, I have no idea what to do with them and it frustrates me to no end, but they make my kids happy so I just let it go. Does Luke ever take them apart or once they are completed, he's done with them? What a cute room! It's sooooo Luke!!! Just the way it should be! This looks so great! I'm so glad you created a space that allowed his creative to flourish. And the solar systems....you may have a genius on hand because I would have never asked for that ha! Girl! He knows all the planets by name, size, climate, blah, blah, blah. He can tell you about the composition and all kinds of other things. He's teaching ME and I love it! Perfect!! His room is adorable!! Love the planets!! So cute! Hi Andrea, Can you tell me where you found Luke's desk? I've been looking for something like that for my twin boys. Thanks! This is going to be zero help (I'm sorry!!!) but I actually found it on Craigslist (the desk and chair together). I'll start looking online and see if I can find something similar. I see others have asked as well...can you share where you purchased the desk from? Such a cute room for sure!!! Hey! I found it!!! I'll post the link above!!! I love that he got to pick out his favorite planets from the bigger kids at school! Super cute space for a creative little boy! Love the room, Luke!You all did a great job designing and decorating! So cute and so much of his personal taste/style. I love the circle shelf! And my 6 year old loves legos too, I get the love/hate relationship. lol. Love this! It will certainly grow along with him in the coming years. that's the plan!!! Thanks, Tanya! So fun and practical. I love it. Luke's room looks great! I can't wait to see more. I miss the sounds of my boys playing with Legos. They were so obsessed that they would actually wear them out from using them so much. We definitely got our money's worth! Such a great boy room! We have been talking about revamping our almost 8 year old son 's room. His first priority is having display space as well for his creations and cars. And I have the same love/hate relationship with Legos. There is something quite satisfying about the sound of sucking a tiny Lego up in the vacuum. One less! Ha! Do you know what size the shelfs are?? These are exactly what I have been looking for to use in our playroom. We don't have an ikea anywhere around us but I thought about ordering some off line if possible. Thanks for the help!! I love the room! And you and I share the same feelings about legos. :) I might have missed this in the post, but where did you get the blue rug? My boys would love it. Such a fun room! I love how you can see his personality in it and love that he asked for a solar system! :) It looks so good! Check out trunks during dorm season. Much less expensive for a quick fix. I've bought one cute bright pink one. Just a thought. Hi Andrea! Do you happen to know which IKEA shelves those white ones with the brackets are? There are a million to choose from, but I love yours! 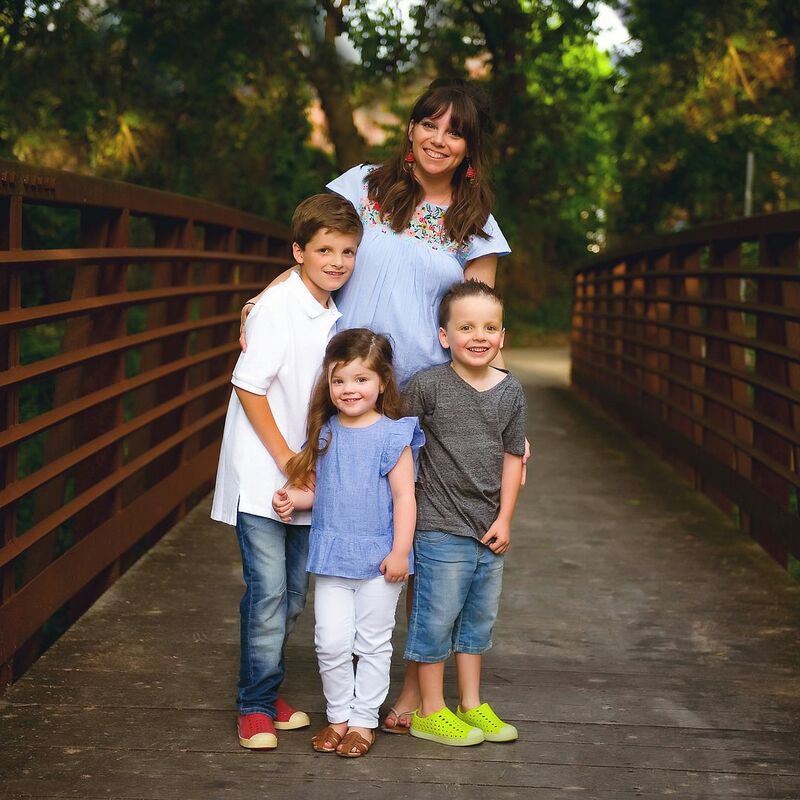 Wife, mom, child of God. Math teacher, creative spirit and night owl. It's Friday AND it feels like Fall around here - talk about the perfect combination! I occasionally link to items using affiliate links. When you click on an affiliate link and make a purchase I may receive a commission. Thank you so much for supporting my blog!